I know I’ve disappeared for the last month – January seems to have gotten away from me, but I was quite pleased with myself for having been able to post at least one handmade/home-baked item per month last year, and had no intention of letting my streak disappear! My mom celebrated a birthday recently, and those of you who follow me regularly know my Birthday Rule. Obviously there was going to be a homemade cake of some kind; it just took me a while to decide which kind. I had contemplated tiramisu (vanilla cake, coffee, Kahlua, chocolate shavings) in all its adult glory, but finally decided I needed something chocolate-based. No matter how fancy I get, she always seems to like my plain chocolate cake/cupcakes best of all. I got the idea to make a chocolate buttercream frosting laced with raspberry syrup (the latte kind, not the pancake kind), with fresh raspberries for garnish. But the true stroke of genius, in my obviously completely unbiased opinion, was to place some raspberries on top of the bottom layer once it had been frosted. It reminded me of some of the fruit tortes from store bakeries, and adds a really nice bit of flavour and texture where one might not expect it. 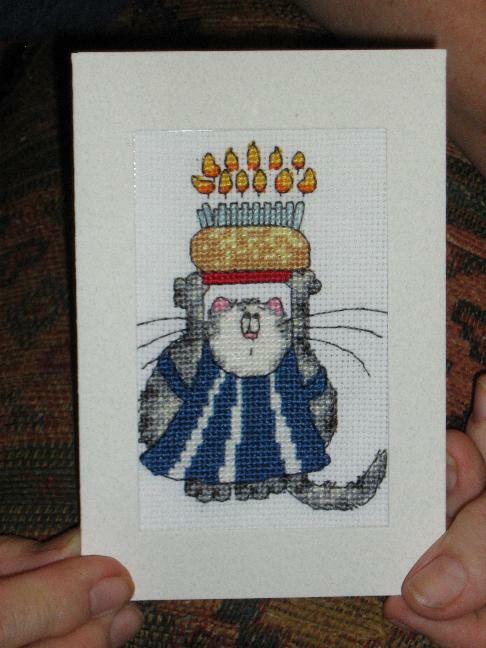 I also had the perfect birthday card in mind: a Margaret Sherry illustration from The World of Cross Stitching a few months back. 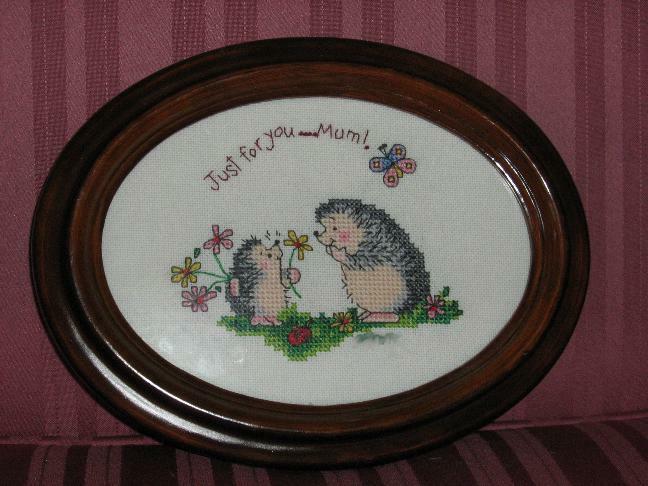 It features a sweet little mouse presenting his hedgehog friend with a birthday cake. When I showed it to one of the other party guest, he commented, “Aw, look at the cute little muskrat!” I’m not sure he was joking. Despite a slow start, this came together much more quickly than I expected. 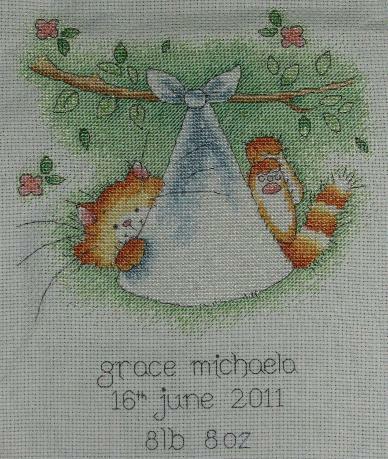 And the backstitch really makes his prickles stand out! 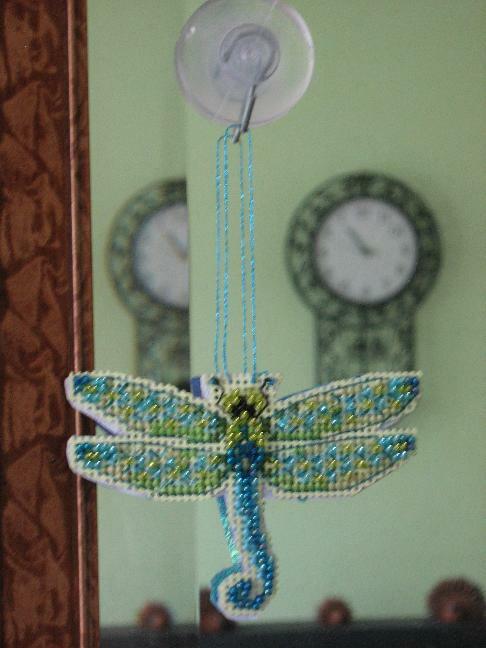 It made a cute addition to my mom’s gift. Paws up for birthday cake! I used 18-count fabric instead of 14 as called for by the magazine to get it to fit in the card, and used random colours that looked close enough to those on the model – perfect way to use what I had laying around. 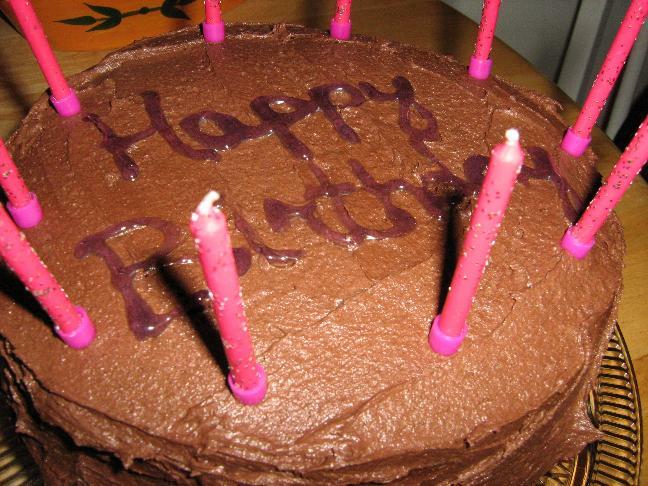 I love the concerned look on his face, and promised to use fewer candles on her birthday cake – if only by one. I don’t think the cake could have been any simpler to make: a double batch of the basic chocolate cupcakes from Vegan Cupcakes Take Over the World, divided between two round layer pans, topped with a coffee-and-Kahlua’ed version of the chocolate buttercream frosting from the same. Because I had serious doubts about my ability to wield a tube of decorating gel, I had the foresight to trace the words onto the top using a toothpick, and then follow the lines. Hey, it may not be terribly skillful, but it worked. And now that it’s all over, I get to breathe easy again, at least until Mother’s Day. Lo, the much-hyped birth announcement has been completed – and less than two months after the actual birth. Go me! It’s an Anchor kit, designed by Margaret Sherry (love her stuff!) called “Little Bundle”. 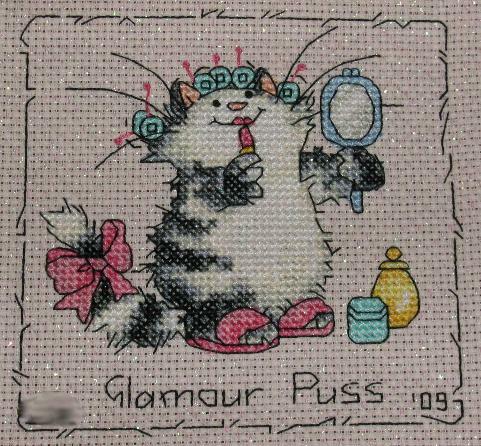 Much like the lovey-dovey Solo the Cat cross-stitch in the last post, this one is full of backstitch that starts and ends at funny places, and would have been easier on evenweave. Despite that, I’m quite pleased with how it turned out; it really was an enjoyable stitch despite the vast areas of green and white. It has yet to be washed and framed, but I’ll be holding off on that for just a little while. When you hear the neighbours having a shouted conversation across the street: “Hey, Bill, how’s your water over there?” “Brown! Yours?” “Yep!”, the prudent thing to do seems to be to wait for the municipal waterworks department to finish their water main repairs before attempting to soak what will hopefully be an heirloom piece. Yes, Mother’s Day was two weeks ago. I’ve been remiss. I did, however, manage to get both little stitchy pieces finished in time for the big day, even if I wound up putting in the last ten French knots the morning of. It was worth the stress, though, and the end result was… ïжак! I found this Margaret Sherry design in an issue of Cross Stitcher magazine and knew that I had to do it up. 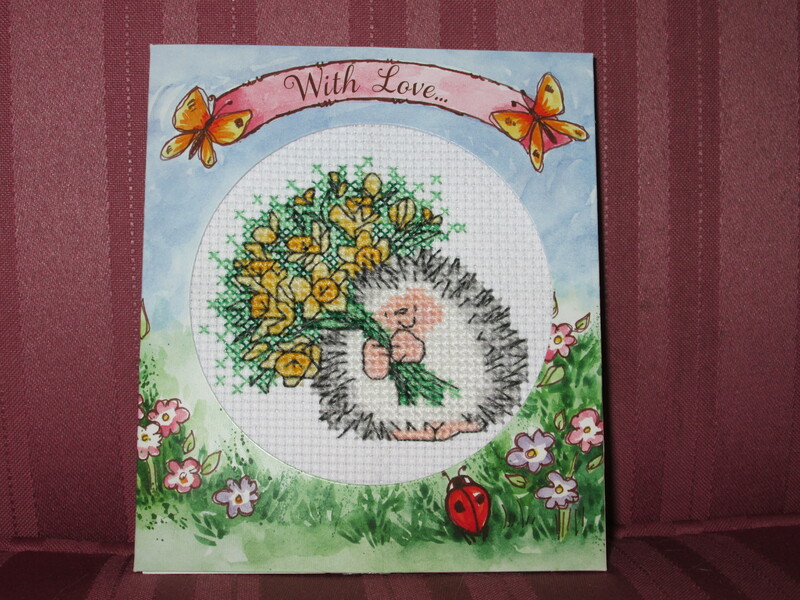 I did it on 28-count evenweave rather than aida, mainly to make the crazy backstitch just a little easier – and did this ever pay off the night before Mother’s Day, as I was frantically working the lettering. This one was from the kitties. 🙂 The kit came with a magnet, but no one would ever get to see it on the fridge, so I finished it as a hanging ornament instead and backed it with some holographic paper I found in my scrapbooking stash. The presents have all been opened…mostly, and the Boxing Day sales are over: at last, I can post what I made for my Avon lady for Christmas. Happy New Year! I could offer the standard excuses for not updating sooner (I spent the entirety of November pounding out a novel! I stitched my little fingers to the bone! I got abducted by a herd of rogue Simmentals! ), but instead, I think I’ll just show off all the stitchy Christmas presents I managed to finish. There they are, posing sweetly on my oven door. I was so happy to have an excuse to use my opalescent aida cloth! It was stitched onto the pocket of a denim shirt using waste canvas…I do like the colours! It’s just a plain blue t-shirt from Michael’s, but sufficiently jazzed up now. Also, Sublime Stitching’s T-shirt Stabilizer is a godsend! Last but not least, this Subversive Cross Stitch pattern (I tweaked the colours and omitted the border) seemed just too perfect for coworker and co-conspirator Sue. It’s now sitting on her desk, spreading sunshine and lollipops to all who venture past. Thanks for looking; as always, if you have any further questions, please feel free to leave a comment!